This lot has 3 very nice pieces. Faded Glory - Pink and yellow plaid sundress, cotton, size 14-16 2. 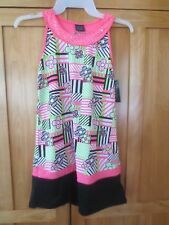 Cato - Black/Pink, fancy church dress, polyester and spandex, Size 16 3. 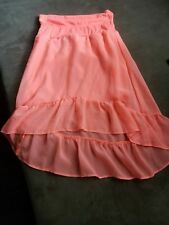 Baby Phat - Tiered, flowers, tulle tiers, polyester, spandex, nylon, size XL. DEB'S TOYBOX CLEARANCE SALE. FADED GLORY DRESS. BY FADED GLORY. DOTS & FLORAL. DEB'S TOYBOX CLEARANCE SALE . BLACK WITH TURQUOISE TRIM. SOFT DRESS. MACHINE WASHABLE. Girl’s Faded Glory Dress Size 7/8 Measurements: Length 24”. 13” from armpit to armpit. Condition is gently used! Excellent condition! Girl’s Faded Glory Dress Size 7/8 Color is Gree, Blue, Black and White. Condition is Pre-owned. It has a snag across the bottom front. No stains or holes. Lenght: front 28.5” back 35.5”. 14” from armpit to armpit. Comes from a smoke free and pet free environment. Popover style with cap sleeves and buttoned front. Has a chiffon overlay in teal with dainty pink and purple flowers. Adorable floral dress from Faded Glory. Girls Size Extra Large ( XL ) or 14 / 16. Navy blue inner lining. Faded Glory and Youngland. Easter Green. Skirt and Dress. 100% polyester. If not paid an “unpaid item case” will be opened on the 4. Girl's short sleeve black and leopard dress by Faded. Glory, size 7/8 (M). The top is black with fake jacket. bottom is flared skirt with leopard color. Goes to just. below the knee. Like new, no problem at all. Girls Button Up Horse Patterned Dress Size 14/16. Faded Glory girls hot pink skirt is in excellent condition. No tear or hole the skirt has two lining. 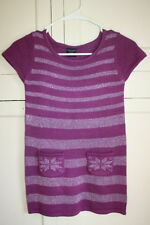 faded glory girls skater dress med 7-8 geometrical multicolor purple 3/4 sleeve. excellent condition like new. measurements: shoulder 11 1/4” sleeve 11 3/4” chest 13” hem 22 1/2” length 27 1/4” Condition is Pre-owned. Shipped with USPS First Class Package. Girls Size M 7-8 Sweater Dress with pockets. COLOR: Purple and Silver. Girl’s dress size large 10/12 in color pink long sleeves with tulle skirt. With inner lining full length. Dress length above knee. Excellent preowned. Dressy. Hand wash and line dry. This is a Faded Glory girls M (7/8) dress. It has lots of character with the animal print bust design. It's made of 100% polyester. Has a solid attached slip underneath. 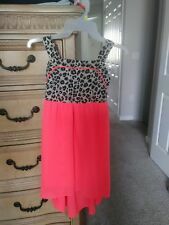 This Faded Glory neon orange dress is pre-owned and only worn twice. New I have a size XS 4-5 Little Girls beautiful Raspberry Pink Dress with Lace. Just beautiful dress from Faded Glory in sz 6/6X. White lace looks so much better than the pictures. Excellent condition. This item is used and is in very good condition. The upper portion of this dress is a red short sleeve sweater with silver sparkles. The skirt is made of 100% polyester. Girl's dress size 6/6X by Faded Glory...super cute design and details!! What a cute and stylish dress for a young girl. It is size 6/6X and is designed by Faded Glory. It is made of 100% polyester. It has short sleeves and the top is a brown,beige,and black leopard design. Girl's Dress Size 6/6X by Faded Glory....For your little one with big heart!! For the sweet girl with the big heart. This dress is size 6/6X and is designed by Faded Glory. The bodice is made of cotton and polyester. The skirt is made of polyester and spandex. The lining is made of 100% polyester. Girl's Pink & Purple Plaid Sheer Dress w/Purple Slip. by Faded Glory.